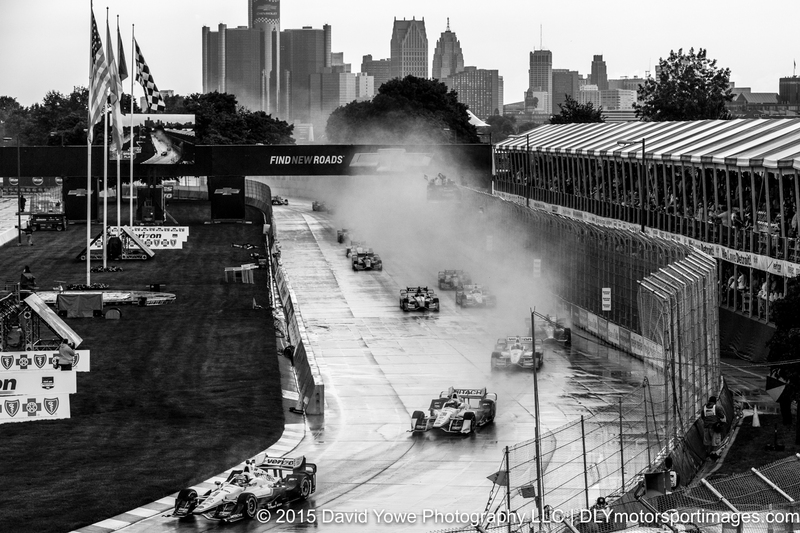 The IndyCar Chevrolet Dual in Detroit Race 1 was held Saturday afternoon under overcast skies and wet conditions. 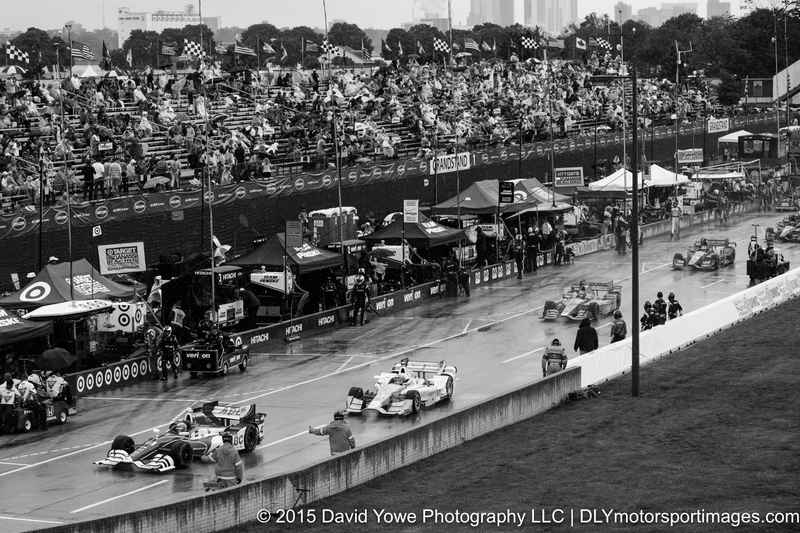 After 47 of the scheduled 70 laps, the race was red flagged due to bad weather. 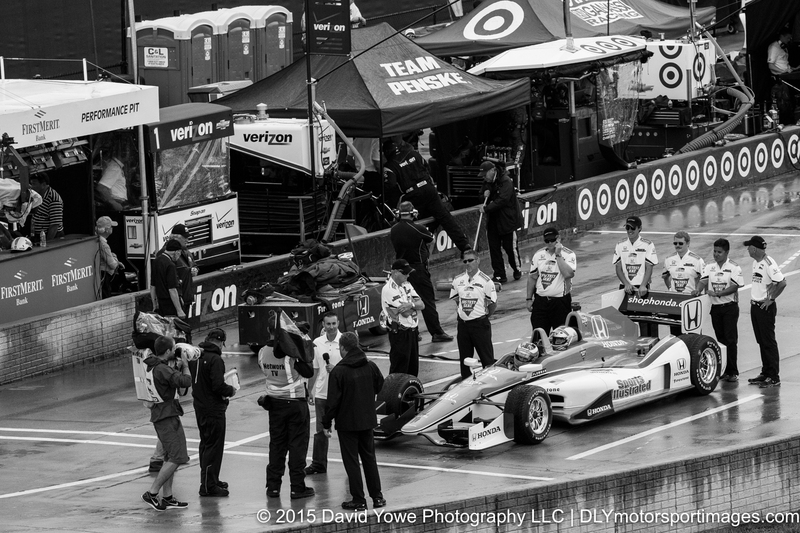 Carlos Munoz won his first IndyCar race in the #26 Andretti Autosport – HVM Racing Honda. Marco Andretti in the #27 Andretti Autosport Honda was second and Simon Pagenaud in the #22 Team Penske Chevrolet was third. 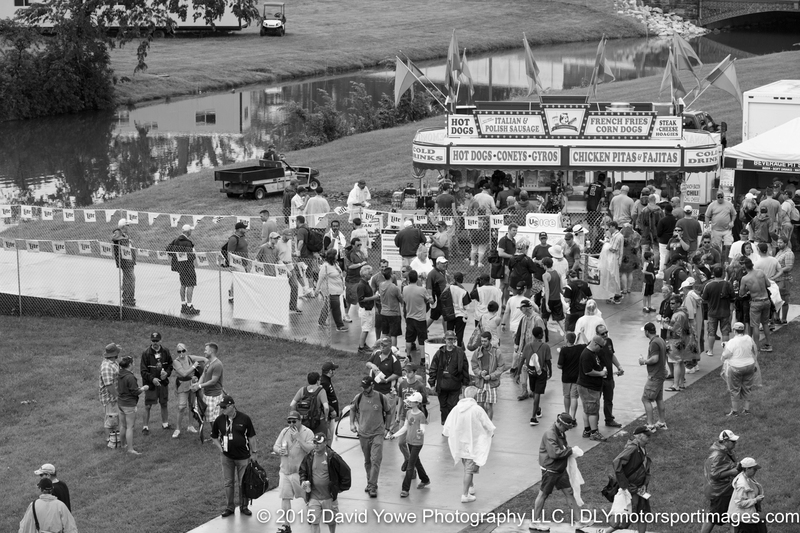 This photo story will be in black and white to reflect the bad weather conditions that we experienced during the race. Hope you like the photos. 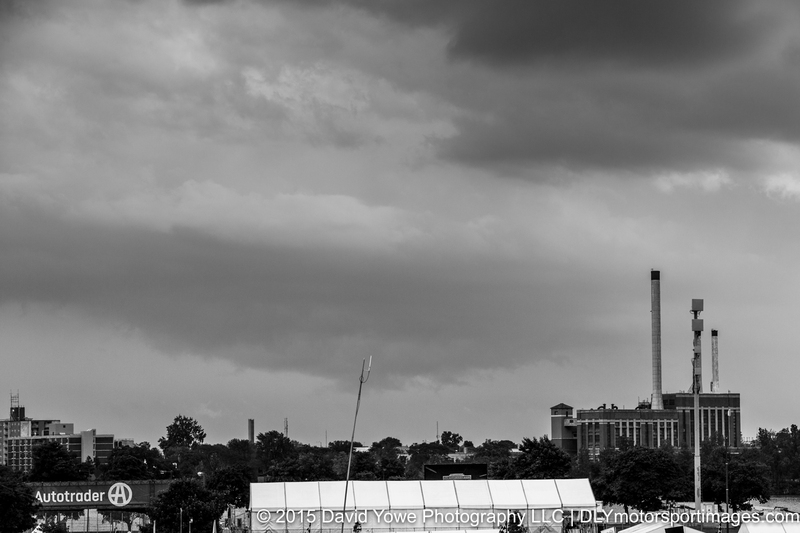 Dark skies were overhead for the start of the race, which were an ominous sign of the rain to come. But despite the bad weather, their was good attendance. 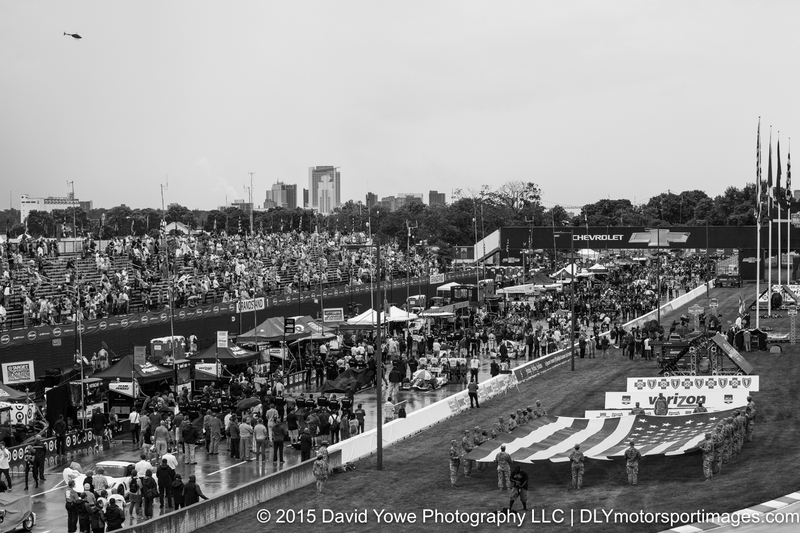 Rain started to fall during the pre-race ceremonies. 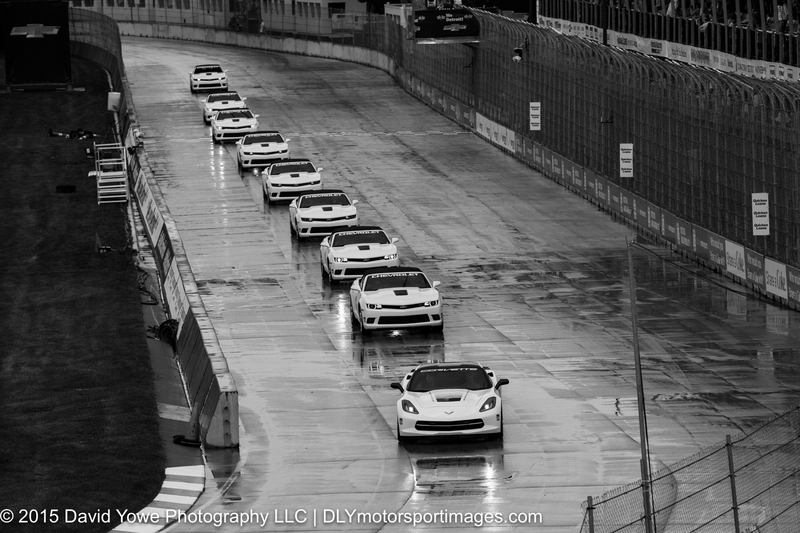 Corvette pace-car and Chevrolet Camaro’s lined up on a wet track. A lucky fan gets to experience what its like to be in an IndyCar by leading the field on the warm-up lap in a two-seater. 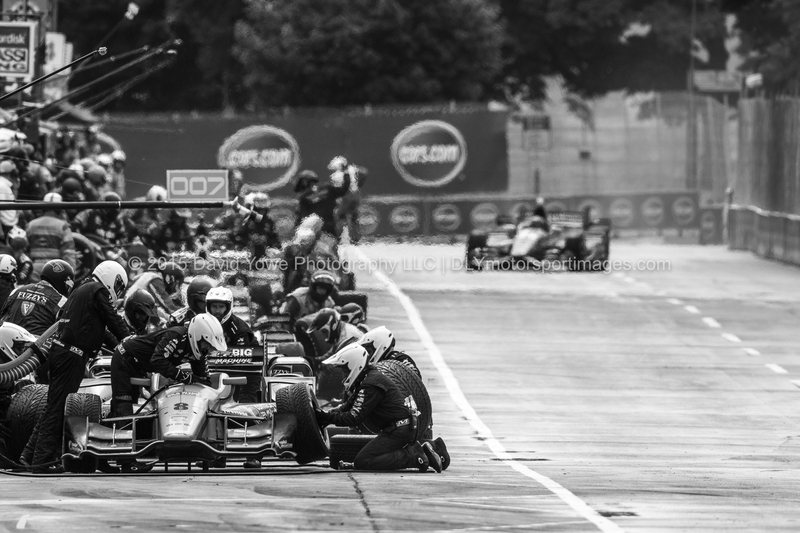 Track marshals give the “thumbs-up” as the IndyCar field heads out of pit lane. 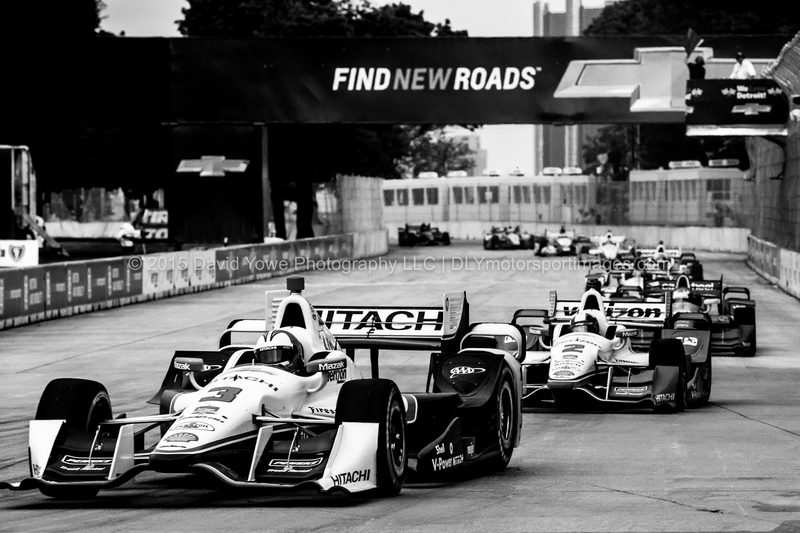 Race start, with Will Power leading the field through Turn 1 in the #1 Team Penske Chevrolet. 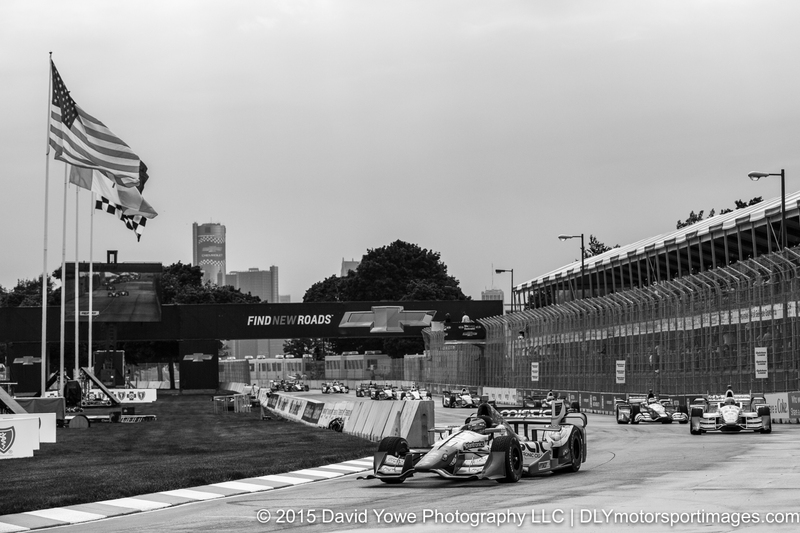 Race winner Carlos Munoz leads the field through Turn 1 in the #26 Andretti Autosport during the early laps of the race on a drying track. Meanwhile, teams were using blowers to dry their track boxes in preparation for a busy pit lane. 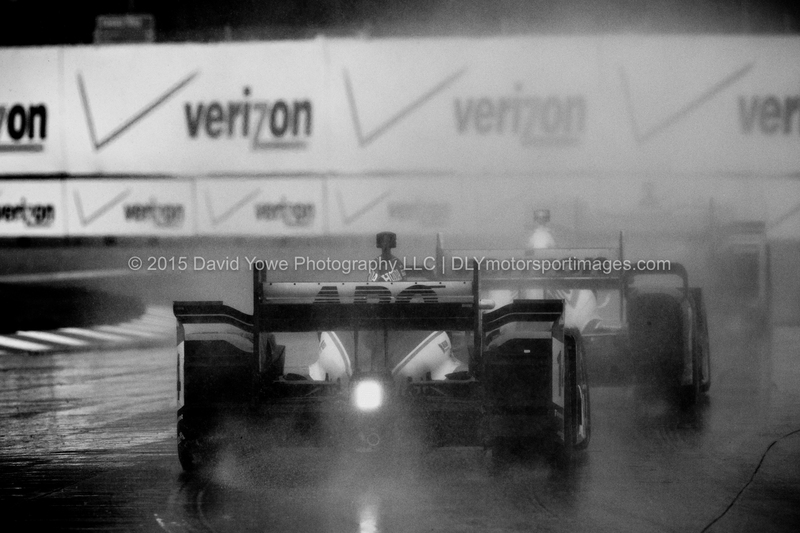 Some teams chose slicks, while others stayed on wet weather tires. 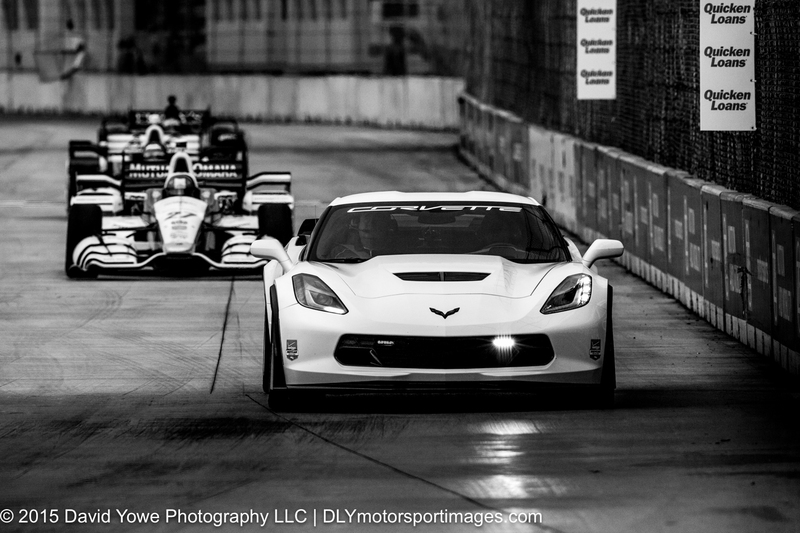 Through Turn 1 with Stefano Colette in the #4 KV Racing Technology Chevrolet. Around Turn 1 with Simon Pagenaud in the #22 Team Penske Chevrolet who placed third. 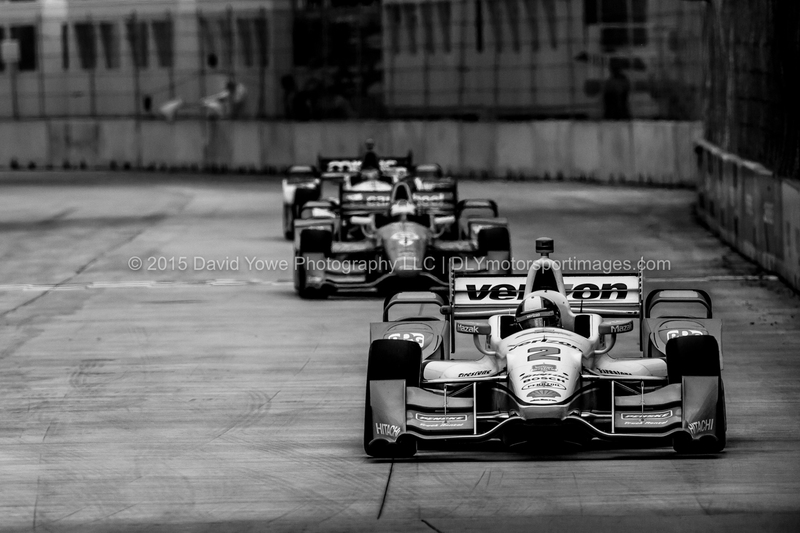 An IndyCar “train” being led by Helio Castroneves in the #3 Team Penske Chevrolet down the front straight. 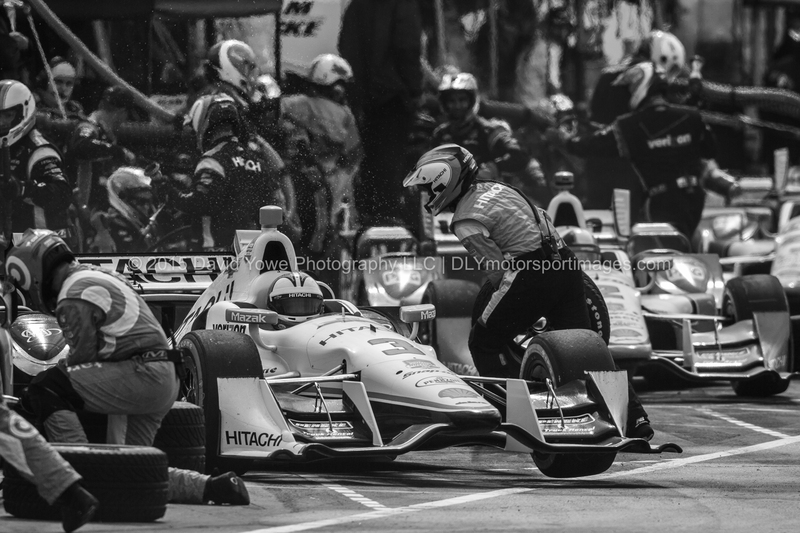 “Head-on” with Juan Pablo Montoya in the #2 Team Penske Chevrolet. Safety car for a full course year flag. 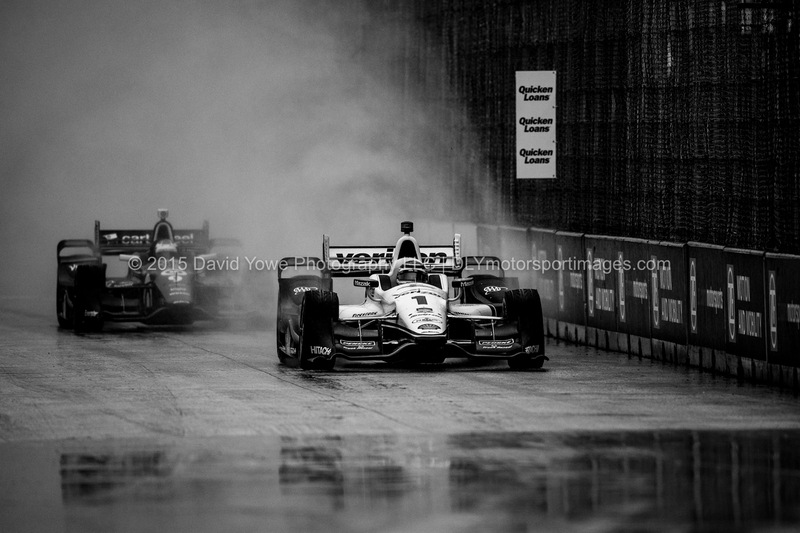 Later in the race the rain started to come down. 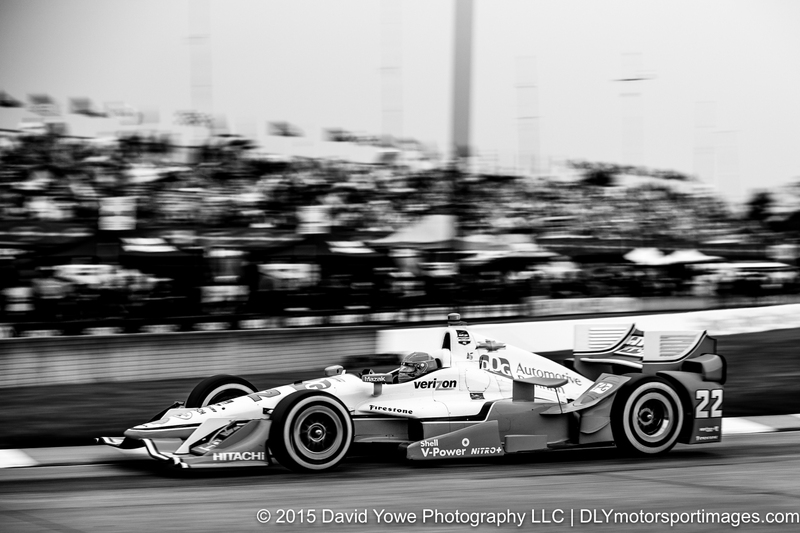 “Rooster-tail” with second place finisher Marco Andretti in the #27 Andretti Autosport Honda. 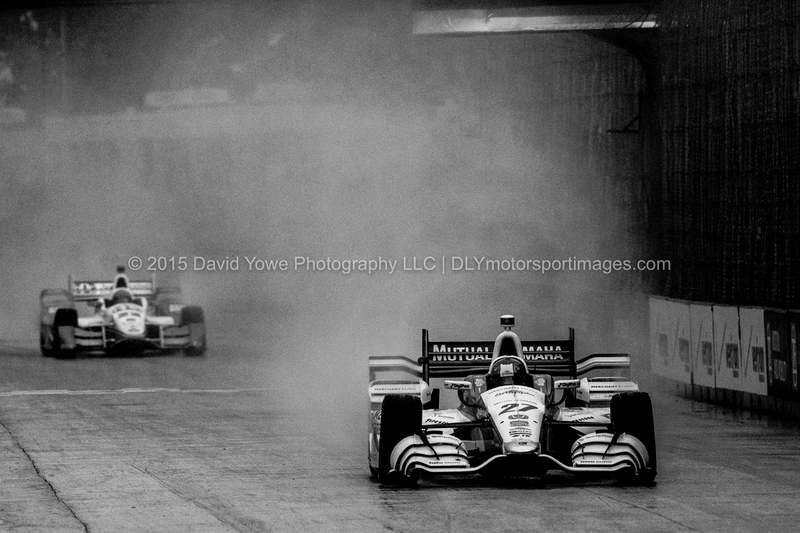 Really like the rooster-tails of water spray behind the IndyCars. 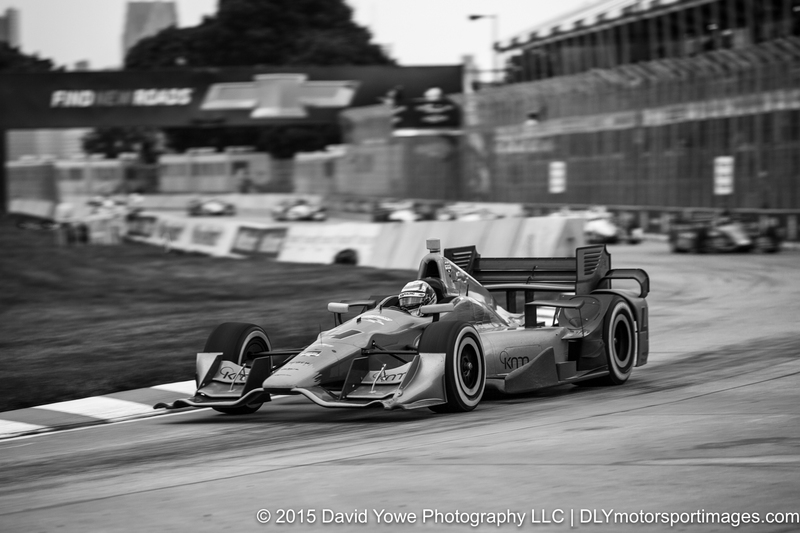 This time its Will Power in the #1 Team Penske Chevrolet. 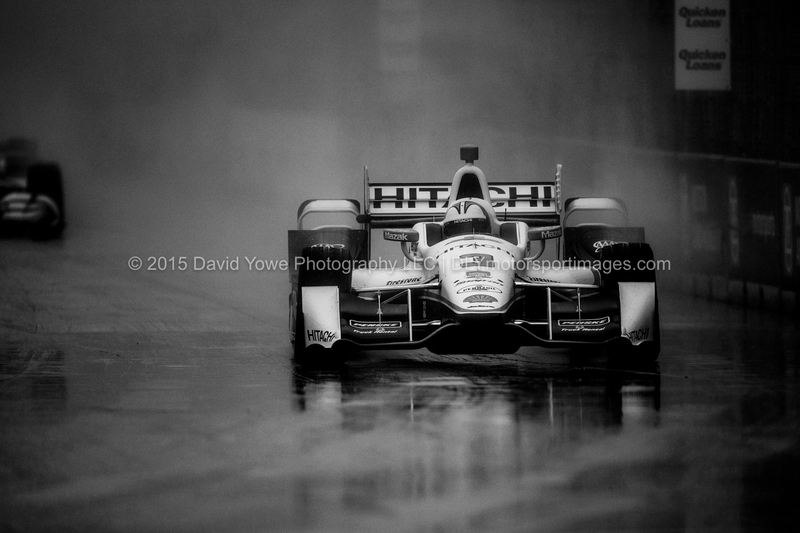 “An opening in the rain” with Helio Castroneves in the #3 Team Penske Chevrolet as he enters Turn 1. Water streaming from the tires of the #41 A.J. 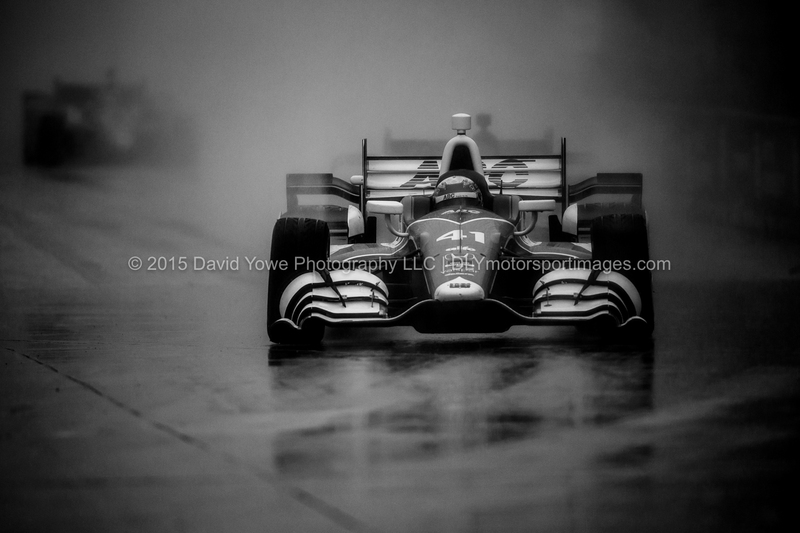 Foyt Enterprises Honda driven by Jack Hawksworth. I think this gives you idea of what its like to see in front of you in the rain. 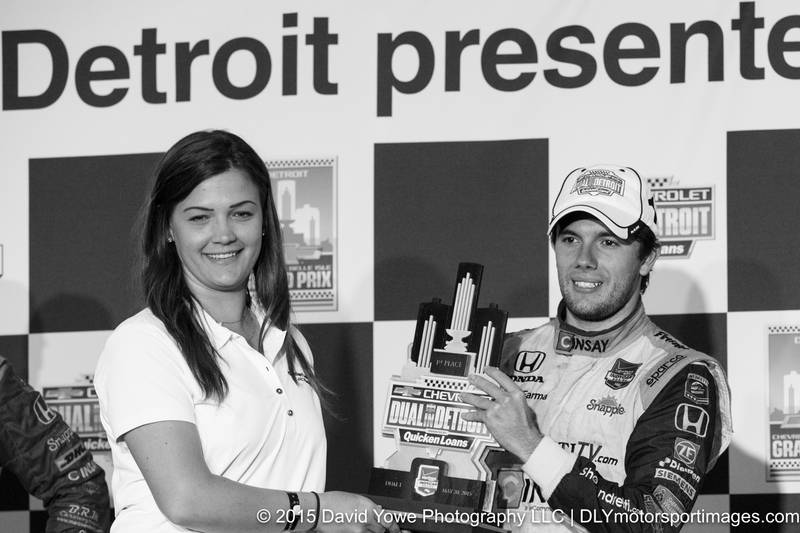 Carlos Munoz accepts the winners trophy. 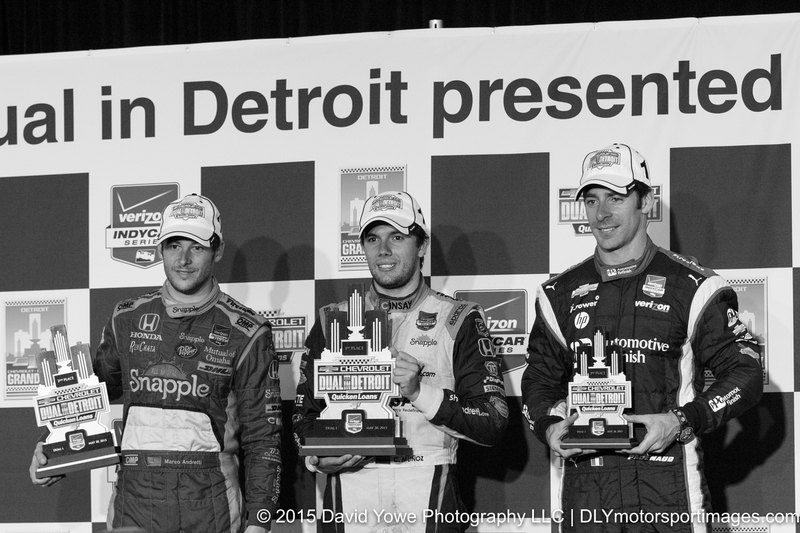 Winners podium with Carlos Munoz (first, center), Marco Andretti (second, left), and Simon Pagenaud (third, right). Great work David. 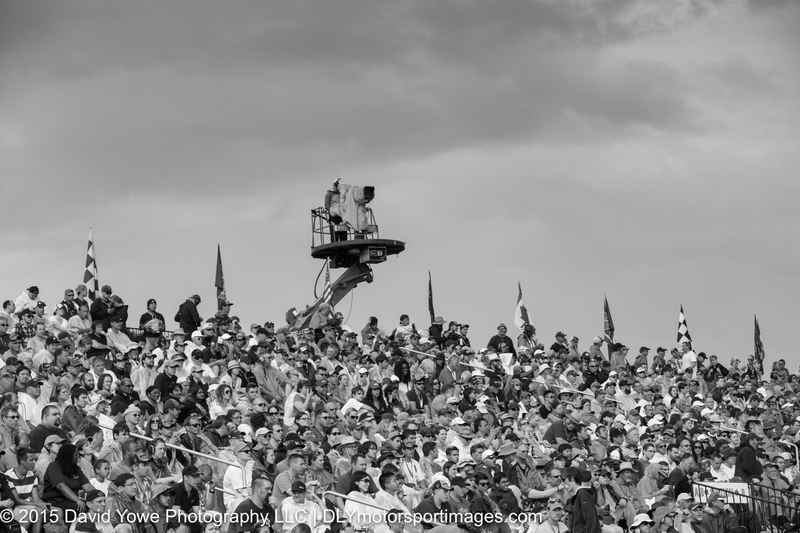 Really enjoying the black and white images.